Four of the world's finest Mexican chefs unite in Chicago this fall to cook, compete, and create. Join them for two days of hands-on demonstrations, intimate conversation and the most memorable meal of your life. Ticket Information: Four chefs. Four styles. One cuisine. At this friendly face-off, each chef defends his vision of Mexican cooking while emcee Ana Belaval, of WGN referees. Includes food, beverages, cooking demonstrations, tastings of tequila, wines and more! Ticket Information: This ticket includes a five-course, Mod Mex dinner at Topolobampo hosted by Chef Rick Bayless featuring chefs Pablo Salas, Curtis Duffy, Fany Gerson and cocktail pairings by Mixologists Joseph Mortera, Dave Arnold and Jay Schroeder. Ticket Information: This ticket includes a one hour VIP reception in the test kitchen featuring a cooking demonstration with Chef Rick Bayless and a bottle of craft tequila bottled exclusively for Topolobampo. In addition, guest will enjoy a five-course, Mod Mex dinner at Topolobampo hosted by Chef Rick Bayless featuring chefs Pablo Salas, Curtis Duffy, Fany Gerson and cocktail pairings by Mixologists Joseph Mortera, Dave Arnold and Jay Schroeder. Space is limited and events will sell out! Proceeds from Mod Mex & Mod Mix benefit students studying culinary arts at Kendall College through two reputable organizations. 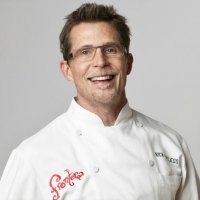 The full-tuition Frontera Scholarship has been offered to Mexican-American students through the Kendall College Charitable Trust in partnership with Rick Bayless since 2007. The Illinois Restaurant Association Educational Foundation Scholarship Program has awarded almost $2.5 million in scholarships to deserving students pursuing Culinary Arts and Hospitality Management in college. The IRA Educational Foundation works to build the future Illinois hospitality workforce through scholarships, career exploration and workforce development programs for high school students.